Crispy Cinnamon Waffles. I wake up in the morning (I should more accurately say, I am woken up) and as soon as I have stepped into the living room, my kids are begging for food. It’s 6 a.m., who in the heck is hungry at that hour? Anyway, I got tired of buying a case of waffles and they’re gone before the week is up. 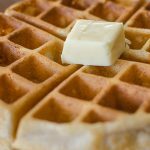 I decided I was going to come up with a waffle recipe, make a ton at once, and freeze any that are left over after they’re done eating. It saves money and I know what is actually in the waffles that they consume so much. This particular recipe has a cinnamon overtone and a nice crispy crust. Seriously, take a bite, inhale, and then breathe out through your nose. It’s like meditation, aromatherapy, and eating all at once. Wake up the family on Saturday morning to the scent of homemade waffles. In a mixing bowl add eggs and vanilla, beat on med-low for 2 minutes (wet ingredients). To the wet ingredients add the room temperature melted butter, vegetable oil, and milk. Beat for an additional 2 minutes. In a separate bowl, combine the dry ingredients: flour, baking powder, salt, and cinnamon. Whisk the ingredients together to combine. Keeping the mixer on low, gradually add the dry ingredient mixture to the wet ingredient mixture (one cup at a time). Allow the batter to sit for 2-3 minutes. Pour the batter into the waffle iron: 1 cup to 1 1/4 cups per waffle. If necessary, before adding the batter use a cooking spray to keep the waffles from sticking. Turn the iron over. Set the timer to 3-4 minutes. (Optional) Allow the waffles to cool slightly on a wire cooling rack to keep them as crispy as possible. Nobody likes soggy waffles. Serve with warm syrup or fruit.